* Stitch love into your life with this latest Valentastic February issue of Just CrossStitch, featuring 20+ projects that are perfect for sharing your love with hand-sewn hearts and lovely florals. * Perfect your Rhodes heart stitch with the Hearts Sampler. This project will have you ready for Valentine's Day in no time! * Embark on a yearlong journey with us as we stitch the showstopping Floral Band Sampler, showcasing bands of specialty stitches. 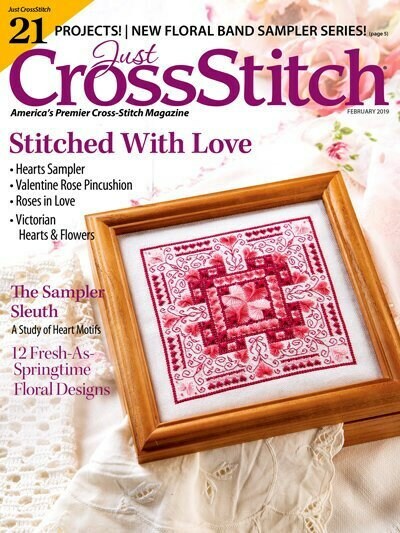 In this issue, Part 1 features four-sided stitch, ray stitch, satin stitch and more! * Curious about needle art history? You'll love our "The Sampler Sleuth" feature! This month explores the use of stitched heart motifs in folk art through the years. * Plus, you won't want to miss our Designer Q&A with Cathy Bussi, designer of this issue's Flower Bookmark and Floral Alphabet projects.